This is the book that I wrote about my Tarot deck. In it, I explore the real, factual history of the Tarot (No one knows, and does it really make any difference?) as well as a chapter about the theories of the history of the Tarot in general, and a recounting of the history of the Robin Wood Tarot. 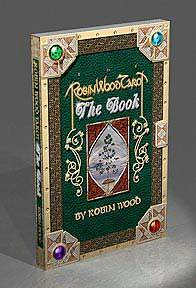 There is a description of the symbolism that is common to most decks, along with a listing of the symbols that are used in the Robin Wood Tarot in particular. The bulk of the book is a description of each card; including a verbal key to help the Reader remember the meaning, a synopsis of what the card might mean in a reading, and a complete description of what is on the card and why I put it there. This is followed by a short discussion of how the Tarot works, how to begin to read (including a section on Grounding and Centering,) and an exploration of the Ethics of reading the Tarot. And, in the very back, there are a few appendices which go into more detail about some of the stories and legends that are mentioned in the book, as well as a section covering the Rules of Tarocchi! This book is available from Amazon as both a paperback and a Kindle book. If you would like to buy it, please use the link below.